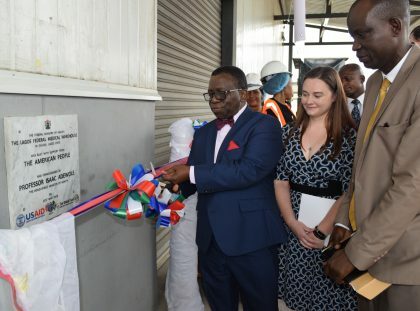 On May 31, 2018, officials from the U.S. Agency for International Development (USAID) joined Minister of Health Prof. Isaac Adewole to commission a central medical storage facility that will enable the Ministry to supply quality, life-saving health commodities to millions of Nigerians. The $5.2 million Lagos Federal Medical Warehouse facility was constructed in partnership with Nigeria’s Ministry of Health and the Global Fund to Fight AIDS, Tuberculosis and Malaria, an international health financing organization. The new Lagos facility provides critical storage space for public health commodities at the central level, enabling the Ministry to ensure the provision of quality, life-saving health commodities for Nigerians through a central facility. With the opening of this warehouse, the Ministry of Health can safely store the medicines required to meet Nigeria’s annual needs for public health commodities in the foreseeable future. “This increase in the availability of high quality commodities will save lives from the lack of medications and proliferation of counterfeit products,” USAID Health, Population and Nutrition Office Director Heather Smith-Taylor said at the ceremony. The 3,500 square meter structure was shipped to Nigeria for on-site assembly, and features smooth dust-free floor surfaces, temperature regulating systems, security systems, thermal insulated ceilings, and warehouse handling equipment. Cutting the ribbon at the ceremony, Honorable Minister Adewole said his Ministry will be “highly involved in the logistics” of the warehouse. “We will continue to offer support, monitor leakages, and the expiration of commodities to ensure better health care for our citizens,” he said. This new facility is the second of its kind in Nigeria. The Abuja Premier Medical Warehouse was commissioned in 2017 by USAID Mission Director Stephen M. Haykin and Honorable Minister Adewole. The two facilities are built to international standards to ensure the safe and efficient storage of medicines and other pharmaceutical products for effective distribution across Nigeria. With the Ministry’s approval, the U.S. President’s Emergency Plan for AIDS Relief (PEPFAR) through USAID and the Global Fund provided support for the construction of the warehouses in both Abuja and Lagos.